The most effective home security scenarios start with a plan. What will everyone do if a fire breaks out? Where do we go if a smoke alarm sounds? What is the fastest exit from where you are in the house right now? What do we all do in case of a burglary? There can be no question that you must plan your home security if you expect to be safe and protected from burglars. 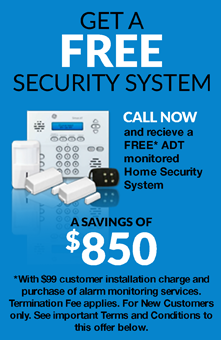 Good home security starts with a monitored home security alarm system, but there are several things you can do in conjunction with a professionally installed security system that will result in additional levels of protection to your home and your family. Here are some excellent tips that will put you in full control of your home security. The last thing a burglar wants is a challenge. They look for easy targets like unlocked doors and windows left ajar. Your primary consideration is to take these enticements away from would-be burglars. Avoid tipping your hand when you’re away from home. Make arrangements for mail and package delivery; have someone shovel your walk and driveway in the winter; set lamps, televisions, and radios on timers so they come on randomly. Whatever you can do to keep a potential burglar questioning whether you’re home or not will deter most of them. There are plenty of easier targets for them, so do what you can to send them on their way. Deadbolt locks offer far more protection against burglaries than most people realize. A professional, case-hardened steel deadbolt – the kind that will sink into your door frame at least a half-inch – makes it very hard to get through any door without drawing an inescapable amount of unwanted attention. Get them installed today and then make sure you use them. Not only will they add a true layer of protection, they’ll also keep wannabe burglars away once they see doors outfitted with them. Keeping your shrubs, hedges, and trees trimmed removes hiding spots around your property. Smart burglars know exactly how to “hide in plain sight”, and removing these hiding spaces will serve to frustrate them. This also removes shadows around your property, which literally serve as another tool in their already extensive arsenal. Don’t give them any assistance whatsoever. Many burglars are all ready at an advantage over some homeowners. Truly effective home security is built on a foundation of diligence and a conscious effort to protect your home and family against emergencies. Taking away all the potential pitfalls will greatly reduce the chances of becoming just another statistic.